This is the guide of how to play <Ragnarok M> on 『NoxPlayer』 emulator, have a try. Step 1：Go to download 『NoxPlayer』emulator. Step 3：Finishing installation, open『NoxPlayer』emulator, download the <Ragnarok M> APK. 1. Login your google account on the build-in google play store, then search Ragnarok M to download and install. 2. Also you can from our official website, and draw it into emulator to install. Step 5：Choose your login method, to start your adventure! 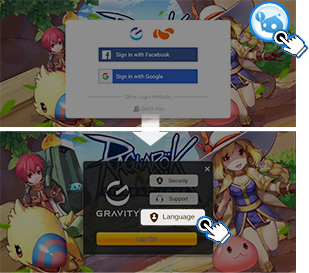 Plus: If you need to switch language, you can do that by cilck the blue Poring button on up-right corner of login screen, then choose your desire language.